Years ago when Mountain Valley Growers moved from cramped quarters in Southern California to the roomy countryside, one of the first tasks was to plant Roses, the perfect companions for so many herbs. It was exciting to have room to experiment with different combinations. Unfortunately, the deer were excited about the Roses too. Within three years the Roses were almost completely gone. What they didnt eat they trampled. It wasnt a conscious transition from Roses to Rockroses, but rather a subconscious desire for beauty that would defeat these ravenous beasts. And, while goats and sheep may graze on the fragrant leaves of Cistus in native shrublands, in the fifteen years Rockroses have graced our gardens, deer have never given them a second look. These evergreen shrubs are found in poor, dry soil of the low scrublands of the Mediterranean. In this country, they are grown in zones 8 and up. They do best on the West Coast where summers are mild in temperature and the ocean breeze helps with moisture. They are tolerant of salt spray and wind and will bloom off and on throughout the summer. In hotter inland areas, the shrubs adapt well, but the blooms are shut down with the advent of temperatures nearing 90 degrees. Usually there is a splendid display of flowers in April. Large drifts of pink and white ephemeral flowers fill our borders and fields. Usually each flower last only until mid- afternoon before gently falling to the ground. The cooler the spring inland, the better the flower show will be. Once established they can tolerate very dry conditions. One thing they cannot withstand is soggy soil. Rockroses must have well- drained soil or moderated water. (Winter rains can be a problem where soil contains a lot of clay.) They can be grown in full sun or afternoon shade. Rockroses come in a variety of forms. Some are sprawling ground covers, like Sunset Rockrose, while others are tall, massive shrubs like Large White Rockrose. The Orchid Rockrose is a large mounding Rockrose suitable for flowing down hillsides. It is not necessary to prune Rockroses, but if space is limited, they can be pruned after blooming. The Golden Guide to Herbs and Spices touts Crimson Spot Rockrose as useful in food, perfumes and detergents. Resembling a wild rose, its flowers are works of art with their crepe paper texture and five snow white petals. each marked with a small maroon blotch at the base. The flowers last only one day but are replaced the next day by another. On a mature Rockrose there are so many flowers every day it is hard to see the bush. Yet, the bush is part of the charm of these plants. Blooming for only a few weeks each spring, it is the shrub’s characteristics as a carefree evergreen that endears it to many. Common names like Gum Cistus (usually applied to C. ladanifer) allude to the sticky resin which is contained in the leaves. This resin is surrounded by many legends concerning its use and collection. It is often told that goats grazing in the Mediterranean hills would get this gummy stuff stuck to their beards. How the resin was gleaned from the beards covers a wide range of interesting story telling as well. Some reports offer that a leather rake was pulled through the hair and the resin would stick to the leather and then be balled off the leather. Some stories say the leather rake was pulled through the plants. And, some stories say the resin laden beards of the goats were cut and worn by Greeks (thus the term goatee). It is also thought that this resin (however it was collected) was used in place of myrrh in certain parts of Biblical history. Genesis 37: 25-...A company of Ishmaelites came from Gilead, with their camels, bearing spicery and balm and myrrh, going to carry it down to Egypt. According to Richard Moldenke in his book, Plants of the Bible, myrrh is not native to Palestine or Gilead, which is the location of the above passages. 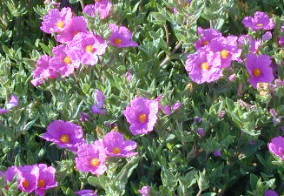 The Cistus is native to this area, though, and that is what is believed to have been used in myrrh's place. Indeed, he writes that the word myrrh was probably a mistranslation and should have been translated ladanum, what today we call labdanum (a word that refers to the cistus extract). And, even though the name labdanum derives from the Crimson Spot Rockrose (Cistus ladanifer), this Rockrose is not native to the Holy Land, but to Southern Europe and some of the islands of the Mediterranean. It was more likely Cistus incanus (formerly C. villosus) or Cistus salvifolius that provided the precious resin written of in Genesis. This highly fragrant extract of the rockrose is a labdanoid terpene. There are many sources of this terpene in nature including Bee Balm and Cistus. The fragrance of this extract is often compared to the ancient fragrance of Ambergris, once highly prized as a fixative for other fragrances. Scientists believe Ambergris is formed in the gut of the sperm whale as a response to irritation from from the sharp barbs of the cuttlefish or the indigestible parts of the squid, perhaps similar to the way a pearl is formed in the oyster. Inside the whale, Ambergris is a less than pleasant smelling black goo. Exposed to the air, it begins to harden, turning to an amber color and developing a powerfully sweet aroma. It was said the one drop of Ambergris applied to paper would last forty years. Since the destruction of sperm whales is now illegal, it is only by chance that a chunk of ambergris would be found washed up on the beach. Today, the sticky tar like labdanum resin is used in place of Ambergris. With a sweet, musky odor, labdanum oil is often blended with Citrus Oils, Clary Sage, Oakmoss, Pine, Juniper, Calamus, Lavender, Tonka, Sandalwood, and Vetiver. And, in Greece where is it still collected, it is used by several Cosmetic companies who prize it for not only its ability to fix other scents but also for its microbial activity. Athens University researchers are looking into the labdanum's effectiveness in killing certain types of cancer cells. When labdanum resin or leaves and twigs are steam distilled, a dark yellow oil is produced that is used in flavoring baked goods, gum and candy, and in laundry products and cleaners. The oil, mainly produced in Spain and sometimes called Spanish labdanum, is also used in aromatherapy for skin care and coughs. Even though the Cistus ladinfer is the most common Rockrose used for extraction, other species also contain this precious gum. This anyone can observe by simply pruning a plant or sniffing the air on a rainy day. Cistus salvifolius or Sage Leaf Rockrose is a low, very erect shrub about two to three feet in height. The white petals have butter yellow centers and are smaller than the three inch wide Crimson Spot Flowers. Its leaves are rough and gray similar to, but smaller than, Garden Sage. It is a good low maintenance edging plant. Cistus corbariensis is a large mounded shrub, four feet or more by four feet. The flowers are small like Sage Leaf Rockrose but more cupped. Unlike Sage Leaf Rockrose whose buds are gray and blend into the foliage, C. Corbariensis buds are a striking red against its dark green and waxy leaves. 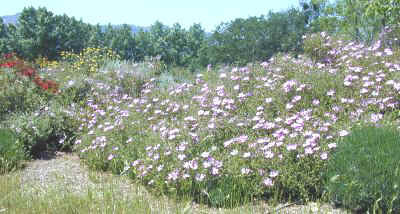 Cistus monspeliensis or Montpelier Rockrose is a larger version of Sage Leaf Rockrose. Bigger leaves, larger flowers, bigger bush; you get the idea. The red rose like buds are much larger on Cistus aguilari. These buds are formed in late winter and remain striking on the plant for a couple of months. A favorite, C. aguilari is the tallest of our white Rockroses, six feet here, and taller in cooler climes. Striking in bud, it is magnificent in flower. Individual flowers are five inches across and are a complement not only to the rich green, glossy leaves but the hundreds of red buds left to open. Sunset Rockrose provides a ground cover Rockrose. Not much over a foot tall, it spreads out 5 feet or more. It has soft textured, sea green leaves, and the darkest of the pink flowers. It is the only rockrose that flowers a little throughout summer as well as the big show it puts on in late spring. Also a ground cover Rockrose, Cistus crispus, Warley Rose, is a strange plant with twisted and turned dark green leaves that covers a 3 foot diameter in about 5 years. It is very low and has proven very reliable. 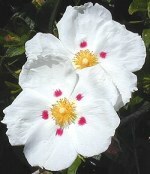 Its flowers are identical in color to Cistus incanus (see below) but smaller. 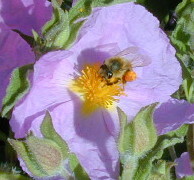 Pink Rockrose, Cistus incanus, is a most prolific bloomer. It also naturalizes very well. Over the last 12 years a small one gallon Pink Rockrose has spread to 30 feet. Some of it is seedling growth and some is layered expansion. The only drawback to this plant is that there are so many seed pods left behind from all those flowers. These could be sheared after bloom but here they are left alone and eventually fall off. It is probably not a coincidence that the most well known rockrose also has the most elaborate flower. 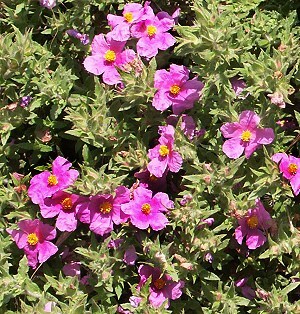 Orchid Spot Rockrose, Cistus purpureus, is often used in landscaping shopping centers or commercial lots. It is a wide spreading cascading shrub 6 feet by 6 feet. An ideal choice for hillsides It looks great planted with Spanish Lavender or Golden Sage. Rockroses are not for everyone. Mediterranean natives, they can only be grown where winters are mild. Five degrees is about their limit. They succumb easily to too much winter water. And, while they can tolerate raging temperatures in summer with very little water, they thrive where temperatures rarely top 90 and the air is moist from the sea. It is a misconception that because a plant is Mediterranean it is desert like. In fact, most of the Mediterranean is moderate in temperature . Rockroses do well here, even with our weeks of 100 degrees plus, but they grow to mature heights slowly and require supplemental summer water. Still when those few weeks of early spring finally arrive and the melding of the millions of pastel flowers becomes a daily experience it is then the Rockrose is truly appreciated.